Who knew that a seemingly standard egg casserole dish could be such a stellar addition to a cozy post-Christmas brunch with friends? I spent what felt like hours researching egg casserole recipes in the days prior to our brunch and eventually decided to merge two recipes together. 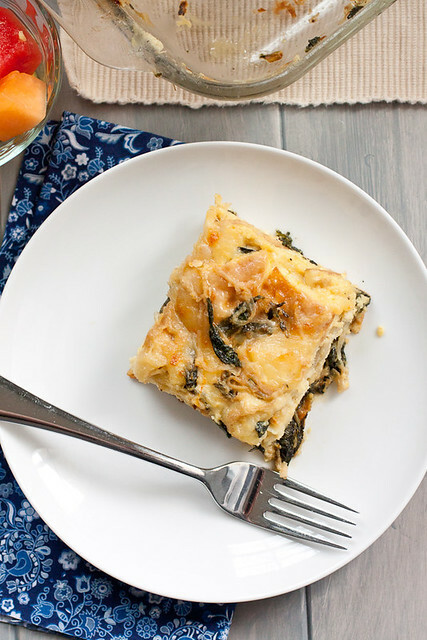 And as it turns out – as if I didn’t already suspect it – caramelized onions, spinach, cheese, and bread in an egg casserole is a fantastic addition to a brunch…or any breakfast, really, where you want to spend time with some of your favorite people. We saw these same friends again a week after said brunch and they were still raving about this dish. Not the homemade waffles or the biscuits and gravy, but this caramelized onion and spinach egg casserole. I think that says it all. 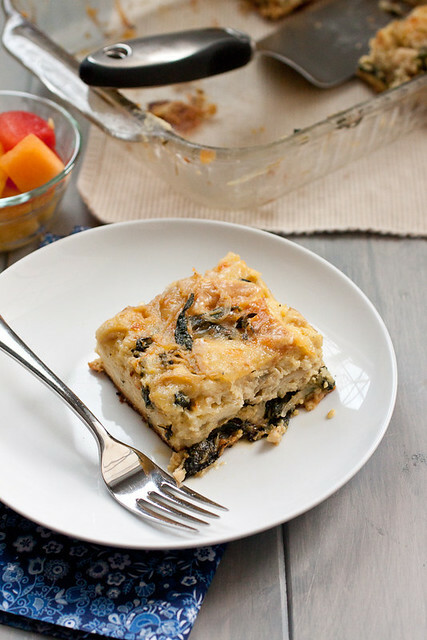 This overnight egg casserole is a complete winner in my book. Feel free to add other veggies to the mix if you choose - kale, chard, mushrooms, peppers, etc. - and change up the type of cheese you use (fontina would be amazing). It's a versatile recipe that helps you take advantage of doing the hard work of entertaining for a group in advance. Heat a large skillet over medium heat and add the butter and oil. Once the butter has melted, toss in the sliced onions, sugar, thyme, and season with salt and pepper. Cook, stirring occasionally, for 30-35 minutes, until the onions are a deep golden brown. Add a few handfuls of spinach to the pan on top of the onions and cover the pan. After 2 minutes, start stirring the spinach into the onions with tongs. Cover the pan and cook for another 1 minute; stir the spinach into the onions again. Continue adding, cooking, and stirring until all of the spinach has wilted into the onion mixture. Remove the pan from the heat and allow the mixture to cool to room temperature. Meanwhile, pour the cream and milk into a large bowl (you can also use your stand mixer or hand mixer for this step). Whisk in the mustard, eggs, ½ teaspoon salt, and ¼ teaspoon pepper until the eggs are well-beaten. Mix in 1 ½ cups of the Emmentaler and ¾ cup of the Parmesan cheeses. Grease a 9x13-inch (3 quart) baking dish and lay the bread cubes out in the baking dish. Cover the bread with the onion-spinach mixture. Pour the milk-egg-cheese mixture over everything in the baking dish, allowing the wet ingredients to envelope the bread cubes. Sprinkle the remaining cheese over the top. Cover and refrigerate for at least 8 hours - overnight is better. Preheat the oven to 350° F. Allow the baking dish to sit on the counter while the oven preheats. Place the dish on a baking sheet. Bake until the casserole puffs up, doesn't jiggle in the center when you shake the dish, and is golden brown on top, 1 hour. If the center of the casserole still jiggles after 1 hour, bake for another 10-15 minutes, checking after 8 minutes. Mine took longer than an hour because the dish was so cold from the fridge. If the top starts to brown too much, lay a piece of foil lightly over the top. Allow the casserole to stand for 5 minutes before cutting and serving. Grease a 9×13-inch (3 quart) baking dish and lay the bread cubes out in the baking dish. Cover the bread with the onion-spinach mixture. Pour the milk-egg-cheese mixture over everything in the baking dish, allowing the wet ingredients to envelope the bread cubes. Sprinkle the remaining cheese over the top. Cover and refrigerate for at least 8 hours – overnight is better. Preheat the oven to 350° F. Allow the baking dish to sit on the counter while the oven preheats. Place the dish on a baking sheet. Bake until the casserole puffs up, doesn’t jiggle in the center when you shake the dish, and is golden brown on top, 1 hour. If the center of the casserole still jiggles after 1 hour, bake for another 10-15 minutes, checking after 8 minutes. Mine took longer than an hour because the dish was so cold from the fridge. If the top starts to brown too much, lay a piece of foil lightly over the top. Allow the casserole to stand for 5 minutes before cutting and serving. Note: Feel free to add other veggies to the mix if you choose – kale, chard, mushrooms, peppers, etc. – and change up the type of cheese you use (fontina would be amazing). It’s a versatile recipe that helps you take advantage of doing the hard work of entertaining for a group in advance. I’m so happy you posted this! It’s definitely a brunch winner! This kind of an egg dish is always a favorite of mine because you can make it ahead. Plus if you made too much, eggs like this microwave so well. Good choice on cheese. You got it, Carol. We had plenty of leftovers (the recipe makes a ton!) and they reheated beautifully in the microwave.